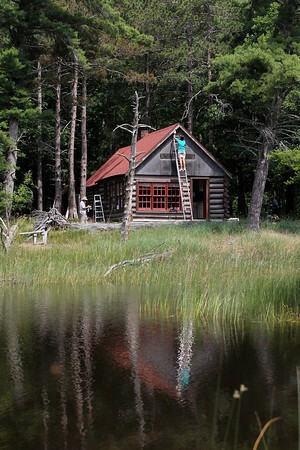 Volunteers with Preserve Historic Sleeping Bear work on repairing the Boekeloo Cabin in the Sleeping Bear Dunes National Lakeshore between Frankfort and Empire on Thursday morning. The cabin was built as a homestead in the 1930s by the Cooper family, and was later owned by the Boekeloo family until the property became part of the National Park Service. The pond is a former cranberry bog the Boekeloo's filled in using a now dry canal they dug from the Platte River.